Why did Pulitzer-winning Theodore Roosevelt biographer Edmund Morris controversially choose to write his authorized biography of Ronald Reagan in the form of a historical novel? 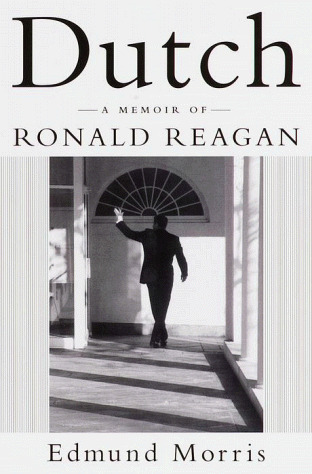 There's a clue in a quote the book attributes to Jane Wyman, Reagan's first wife. As Ronnie speechified about the Red Menace at a 1940s Hollywood party, Wyman allegedly whispered to a friend, "I'm so bored with him, I'll either kill him or kill myself." This anecdote, if true, is more revealing than Nancy Reagan's charge in the book that Jane had attempted suicide to get Ronnie to marry her in the first place. Jane was no intellectual--Morris cracks that "If Jane had ever heard of Finland, she probably thought it was an aquarium"--but he found to his horror, after years of research, that he felt much the same as Wyman. Reagan was as boring as a box of rocks, as elusive as a ghost. Decades before Alzheimer's clouded Reagan's mind, he showed a terrifying lack of human presence. "I was real proud when Dad came to my high school commencement," reports his son, Michael Reagan. After posing for photos with Michael and his classmates, the future president came up to him, looked right in his eyes, and said, "Hi, my name's Ronald Reagan. What's yours?" Poor Michael replied, "Dad, it's me. Your son. Mike." Despite deep research and unprecedented access--no previous biography has ever been authorized by a sitting president--Morris could get no closer to Reagan's elusive soul than Reagan's own kids could. So Morris decided to dramatize Reagan's life with several invented characters--including a fictionalized version of himself and an imaginary gossip columnist who makes wicked comments on Reagan's career. This is one weird tactic, forcing the reader constantly to consult the footnotes at the back of the book to sort things out, and Morris makes it tougher by presenting his invented characters as real, even in the footnotes. Ronald Reagan moved from moderate success as a movie actor to become governor of California and president of the United States.